Samsung slashed the price of its latest high-end tablet, the Galaxy Tab S3 9.7-inch, by $100. The slate is now available for just $499.99 at various retailers in the United States, although the Galaxy Tab S3 was launched for $599.99 a few months ago. 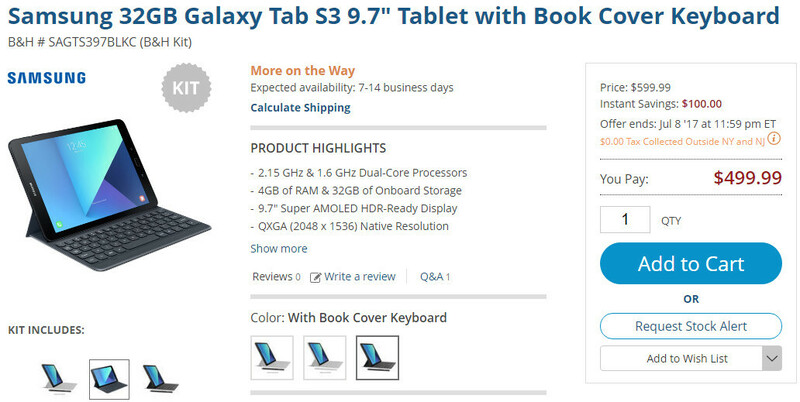 If you haven't yet taken advantage of one of the many deals on the Galaxy Tab S3, here is one that's better than anything we've seen until now. For a limited time, B&H is selling Samsung's tablet for the same $499.99 amount but throws in a free book cover keyboard. The book cover keyboard that's available for free at B&H usually costs $130, so you'll be saving no less than $230 in total when you buy the bundle. According to B&H, the promotion will end on July 8, so you still have a few days to decide on whether o not to take advantage of the deal. It's also worth noting that the bundle's expected availability is now set to 7-14 business days, so if you order one, you'll have to wait quite a while to get it. $500 isn't a deal especially for an Android tablet. $600 is way too expensive. I think it needs to be a little less expensive if you ask me. No, for once I actually agree with something that came out of your mouth. iPad is a better tablet than any Android tablet. Android tablets are greatly productive. Hell no, a lot of apps still have scaling issues while windows at the same price range is waaaay more productive. You could get a certified refurb by Microsoft surface pro 3 for 500-600 ish, it will come with the one year warranty too. That thing will crush the s3 in the productivity department. Are there any good apps the equivalent of Pages, Keynotes, iMovie and Numbers for android? Got my S2 8 couple months ago. Good for media although it's 4:3 aspect. not many high-end Android tablets these days... I can't seem to find anything that uses SD82x or 83x SoC?